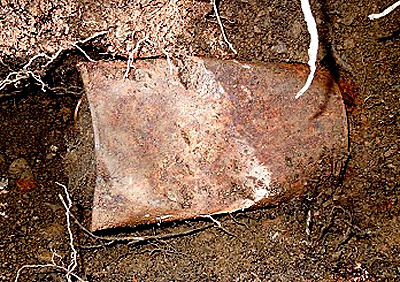 While walking a trail on their property in Northern California, a couple happened upon a rusty can that was partly sticking out of the ground. 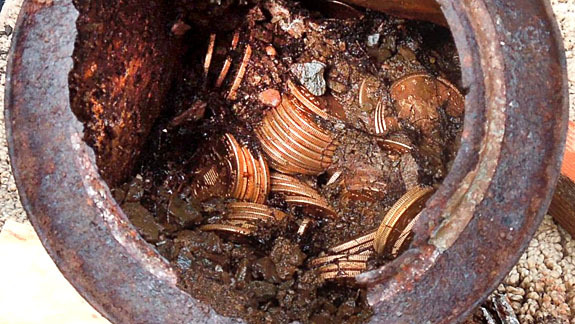 What they discovered is now being called the “greatest buried treasure ever unearthed in the United States” — a trove of 1,427 gold coins from the Gold Rush era estimated to be worth more than $10 million. The lucky couple, who want to be identified by their first names of John and Mary for fear of uninvited speculators descending on their property, couldn’t have imagined how their lives were going to change when they used a stick to scratch the rusted can out of the ground. The can was sealed on both ends and they had no idea what was inside. All they knew was that the can was very old and very heavy, according to an interview published at kaginsinc.com. (Kagin’s is a currency firm representing the couple). As he struggled to get the rusty can back to their home, John’s best guess at the time was that it was filled with lead paint. But, then the lid cracked off, revealing the cache of gold coins. Later, the couple went back with a hand shovel and dug out five more cans. A sixth was found with a metal detector. Nearly all the coins were in pristine condition. 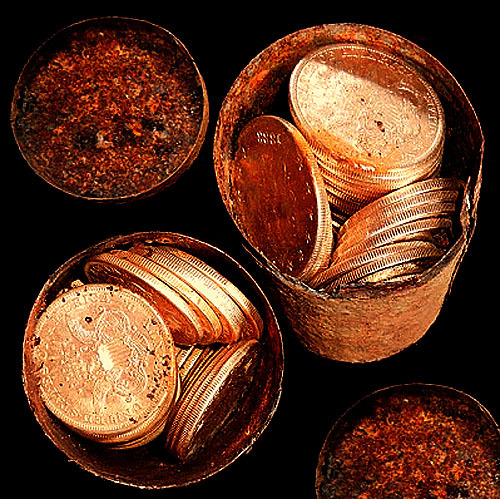 The 1,427 gold coins, which are being called the “Saddle Ridge Hoard,” were all dated between 1847 and 1894 and coincide chronologically with California’s Gold Rush of 1849. There were nearly 1,400 $20 gold pieces, 50 $10 gold pieces and four $5 gold pieces. The rarest of all is an 1866-S No Motto Double Eagle, which is valued at $1 million. The couple has no clue as to who might have buried the coins. The cans were discovered at varying depths, so the couple believes they may have been buried at different times. McCarthy reported that Kagin’s will sell most of the coins on Amazon.com in a special part of the web site dedicated to collectibles. John commented that the couple is likely to keep a representative sample of the hoard — “something to leave to relatives when we pass on,” he said. 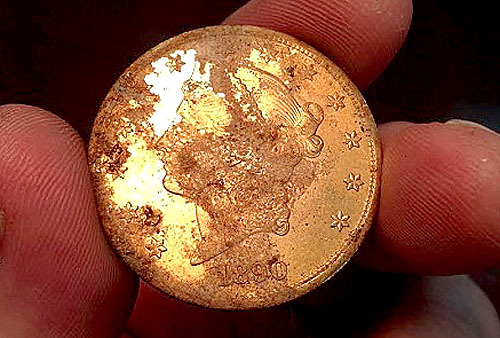 In retrospect, Mary and John said there were at least two clues that the coins were buried near the trail they've used almost every day for years. First, they always wondered about an oddly placed angular rock that pointed right to the spot where the cans were buried. “If you walked 10 paces toward the North Star, you end up smack in the middle of the coins,” Mary said. Second, the couple had noticed years ago that one of their trees had a rusty can hanging from it. Apparently the tree had grown around the can. At the time, the couple assumed that the can might have been a place where people put flowers at a gravesite.